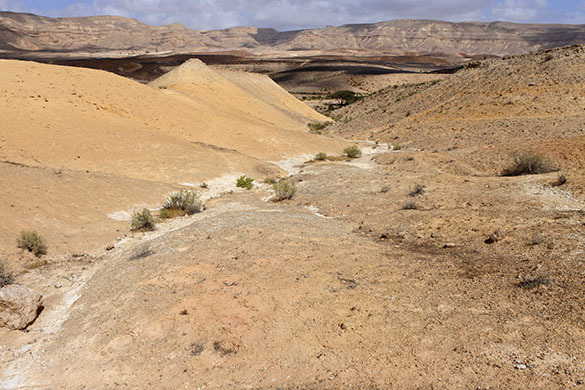 MITZPE RAMON, ISRAEL — For my last day of fieldwork during this short Spring Break trip to Israel, I returned to Makhtesh Gadol to collect a bit more data from subunits 65 and 66 of the Matmor Formation (Middle Jurassic, Callovian). 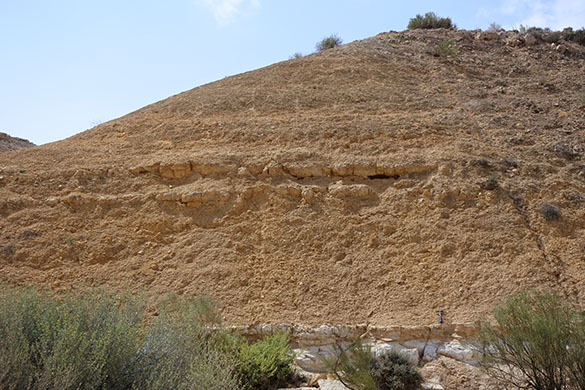 The above image shows part of my field site in the Meredith section north of the “British Road” across the top of the makhtesh. The yellowish marls are subunit 66, with the white limestone of subunit 65 peeking out at their base. The Matmor Formation is distinguished by this alternation of carbonates and marls, and the faunas in each sediment type are very different. I did not do any collecting today. Most of my work was tracing rock units, photographing fossils, and taking lots of notes. 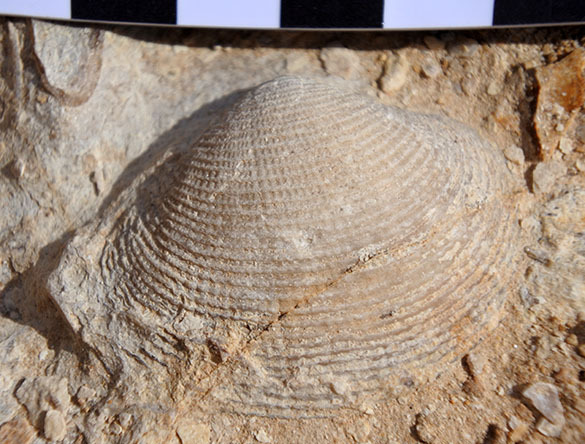 Above is a nice bivalve in the limestone of subunit 65. 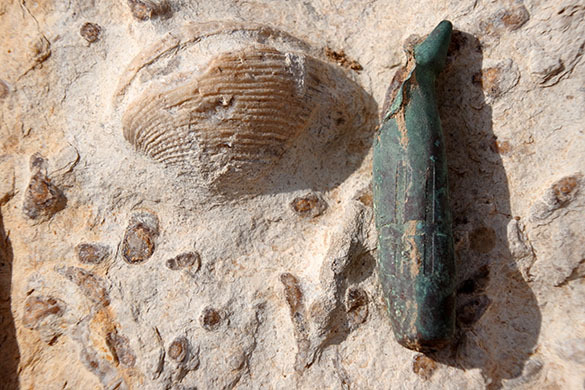 Here’s another bivalve with a spent bullet for scale. (Dramatic effect. There is far less ordnance in Makhtesh Gadol than other places I’ve worked in the Negev.) 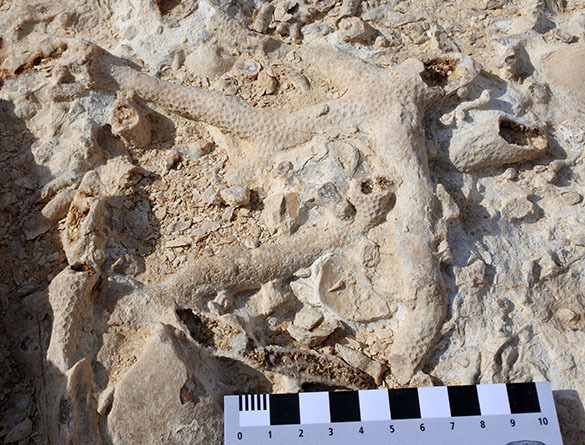 Note that the bivalve is articulated (both valves are locked together), meaning it likely was buried alive. Almost all the bivalves in subunit 65 are articulated. There is one horizon in subunit 65 with a surprising number of branching corals. These look very much like the modern Acropora, but they’re not. This is again the boundary between the white and resistant subunit 65 and the yellowish and nonresistant subunit 66. I have no images of fossils to show you from subunit 66 because they weren’t very photogenic. They are relatively rare and consist mostly of small solitary and colonial corals and occasional oysters. Thus ends my 2016 fieldwork in Israel! I learned a lot in these eight days of exploration and study, and I worked with excellent colleagues. I have some ideas now for a project that will place these Middle Jurassic rocks and fossils in a global paleobiogeographic and evolutionary context. Many future Independent Study projects are possible!